Please contact the office of Family Institute of Connecticut to arrange a media interview at 860-548-0066, (844) 801-FICT , or e-mail info@ctfamily.org. March 13, 2013 (Hartford, CT) – Maggie Karner, a young woman with the same glioblastoma diagnosis as Brittany Maynard, will be speaking at Second Thoughts Connecticut’s press conference against HB 7015, which would legalize assisted suicide. The press conference is scheduled for 2:30 p.m. on Monday, March 16 in room 1B of the Legislative Office Building. She will be joined by advocates from the disability community including Craig Henrici, Executive Director of the Office of Protection and Advocacy for Persons with Disabilities, CathyLudlum, and Stephen Mendelsohn. Karner recorded a video letter to Maynard last October which has gone viral, receiving over 415,000 hits on YouTube (https://www.youtube.com/watch?v=1ZR-qB3HaQY). Her central message is that assisted suicide is not just about people like Brittany Maynard or herself with “terminal” diagnoses, but about all of us. “Death-with-Dignity” and “Aid in Dying” are “Assisted Suicide” pursuant to Connecticut law, jurisprudence and the American Medical Association. As the public and policymakers discuss proposed legislation in Connecticut, it is critical to use terms that are generally accepted and accurate. In June, 2010, a Connecticut Superior Court, the highest court to address assisted suicide in CT, dismissed the case of Blick vs Connecticut, and Justice Aurigemma, writing for the entire Court stated . . . It is wrong to carve out exceptions to laws against assisted suicide. Laws against assisted suicide protect vulnerable and depressed people from being abused and forsaken in our society. Providing “suicide prevention” for some and “suicide assistance” for others is discriminatory. Once government starts to make suicide acceptable in some circumstances, then other groups will logically petition the legislature, courts and doctors for their suffering to end and that their suicides be aided also. For more information about “bracket creep” and the phenomena of expanding euthanasia and assisted suicide to other groups of people including people with mental disabilities, prisoners, children and people with existential anxiety, please visit Euthanasia Prevention Coalition. A majority of Connecticut residents oppose licensing doctors to prescribe lethal drugs. According the latest scientific poll of Connecticut residents from 2014, a 55% majority do not support licensing physicians to prescribe fatal drugs for terminally ill patients. An earlier poll by Quinnipiac University occasionally touted as showing support for assisted suicide, did not even use terms such as “assisted suicide” and used emotional language such as “living in severe pain”. The Q-poll questions were also numbers 49, 50, 51 and 51a of what anyone would consider, a very long poll on a variety of issues from gun control to politics. The Marist poll uses natural language and is much more in depth and probing with regard to residents true feelings. 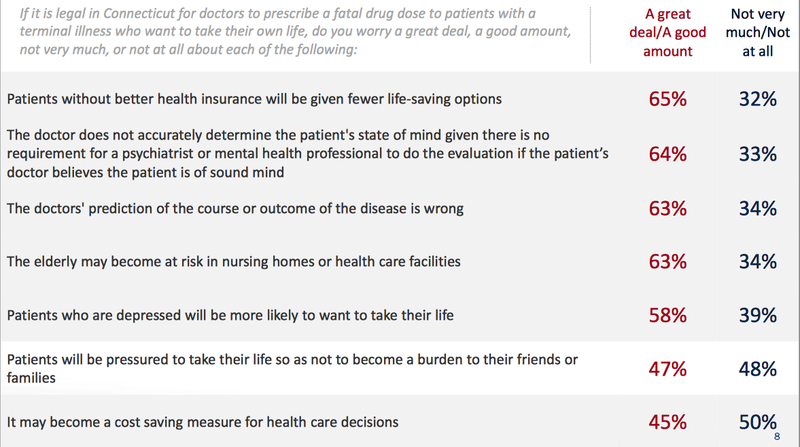 Connecticut residents have concerns about assisted suicide and below is a list of them from the poll . . .
An image from the 2014 Marist poll. Many Connecticut residents worry about abuse if physicians are allowed to prescribe fatal drugs. It is wrong to assume that Connecticut residents oppose assisted suicide only for theological reasons. The national proponents of assisted suicide regularly contend that people oppose assisted suicide for mainly religious reasons. Do not accept this attempt to marginalize opponents. Many of the thousands of residents who support Family Institute of Connecticut and its opposition to assisted suicide, do so out of a love of their neighbor, but also based on evidence of abuse from regions where assisted suicide and euthanasia are legal. The media may also be interested in opposition to assisted suicide from the perspective of Massachusetts and Connecticut residents with disabilities and many people who identify as socially progressive. Assisted suicide is not an issue that falls solely within any particular political or sociological group. Opposition to assisted suicide is diverse. For more information visit our page on assisted suicide. Connecticut residents like Maggie Karner, Cathy Ludlum and Elaine Kolb oppose assisted suicide and have publicly rebuked these bills and repeated attempts to pass it in Connecticut. After spending over $425,000 in two years, the out-of-state lobbying group that agitates for assisted suicide laws in Connecticut has had their discussion and lost repeatedly. In court, in 2009, 2013 and again in 2014 by failing to even have their bill scheduled for a vote in the Public Health Committee. In fact, notwithstanding being funded by George Soros, Compassion & Choices has dramatically decreased their level of spending in Connecticut in 2015 showing that the issue has failed in this state despite their enormous effort. Their spokesperson declared in a January 6, 2015 interview that “It appears that the electorate doesn’t care that much about it, no matter what the polling says.” The Connecticut electorate knows they would be better served by expanded access to early palliative and hospice care, increased funding for home health care workers and mandatory training for pain management techniques for medical students. These would be ways to help hundreds and thousands of Connecticut residents in ways that laws permitting assisted suicide cannot.